When a sample has been taken, and some parameter or measure such as the mean value has been calculated, this provides an estimate of the population parameter. However, it remains an estimate, and different samples might yield a range of different values for the parameter. It is helpful to have some idea as to the size of this range since the expectation is that the true or population value will lie within this range, but without taking a very large number of samples the possible range remains unknown. However, if the distribution of the observations is known it is possible to provide an estimate of upper and lower limits which will include the population parameter with a given level of probability. Such bounds are known as confidence limits, and the range or interval as the confidence interval for the parameter in question. In many instances such limits are sought for an estimate of the mean value or for a proportion. In general confidence intervals for a mean value are obtained based on an assumption that the observations are Normally distributed even if the data do not fully conform to this assumption. For other parameters, such as the variance, confidence limits are affected more by the underlying distribution. For example, if k=1.96 the sample mean will lie in the range indicated with a probability of 95%, a value that is obtained from the area under the Normal distribution leaving a lower tail of 2.5% and upper tail of 2.5%. If k=3 the limits, which would be considerably wider, would provide 99.7% confidence of the possible range of values the true population mean. The multiplier, k, here is often written as zα/2, where z refers to the unit Normal distribution variate at the level α/2. In the example just cited, α/2=0.025 and (1-α)=0.95 or 95%. If the sample size, n, is not large (for example, n<20) the estimated value of the population standard deviation is itself subject to uncertainty, so the confidence intervals need to be larger still. In this case a small-sample approximation to the Normal is used, known as the t-distribution. The confidence limits are computed in exactly the same manner as above, but with values of k from the t-distribution being used in place of those from the Normal. If we take α/2=0.025 as before, the multiplier is 4.3 for a sample size of 1, falling to 2.23 for a sample size of 10, 2.09 for a sample size of 20, and to 1.96 for very large samples (at the limit as n→∞). This interval estimate (known as a Wald interval) can be significantly improved upon for some 'rogue' values of n and p, even when these are large (see further, the section on tests for a proportion). If the population is of finite size, N, the second term in these expressions is adjusted by a factor (N-n)/(N-1), although if n is small in comparison to N (<5%) the adjustment has little effect. This analysis suggests that the surgeon in question was indeed performing very poorly when compared with the national benchmark. It should also be noted that the idea of confidence intervals is essentially a frequentist perspective, and Bayesian analysts tend to prefer the rather more subjective notion of belief or credible intervals. The odds ratio provides an indication (in the range 0 upwards that) of the relative odds of infection (or other factor) of exposed subjects when compared with those not exposed. A value of 2, say, would indicate that exposure was twice as likely to result in infection than non-exposure. It is often convenient to work with the loge of the odds ratio, LOR, as this reduces the expression to a set of additions and subtractions and scales the ratio in a convenient manner. It is also common to compute the ratio and its standard error after adjusting each value by +1/2 (Yates correction). The odds ratio, OR=(23x1654)/(9x105)=40.26, or the log odds ratio, LOR=ln(OR)=3.7, with a 95% confidence interval defined using a z-value (from the Normal distribution) of 1.96 — this gives a confidence interval for the log odds ratio of +/-0.8, i.e. a range for the log odds from 2.9 to 4.5 or 18 to 89 for the odds ratio itself, a very wide spread. Note that these confidence intervals rely on the asymptotic approximation of the Normal to the exact odds, but in many cases this is an adequate assumption. The significance of a particular logs odds ratio can also be computed using the ratio LOR/SE, which in this instance is 3.7/0.4=9.1, a very large value when compared to the percentage points of the Normal distribution, hence highly significant. This particular example is based on the test data for the oddsratio() function in the vcd library (visualization of categorical data) in R (see further, R code samples section). The data is included with the library and comprises eight separate age grouped strata, hence 8 2x2 tables of the kind shown above (9 sets should have been included but the 20-24 age group was omitted by the vcd team in the dataset below — it is now included). The current version of the vcd library forms the supporting material for the textbook on "Discrete Data Analysis with R" by Michael Friendly and David Meyer (FRI1). Computations are performed using the LOR and with Yates corrections applied in each case. 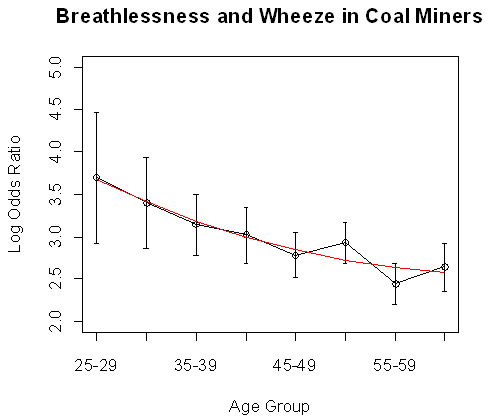 The results of the confidence interval analysis of each of the strata with a simple quadratic fitted line shown.